WILDNorth officially launched its exciting new WILDRescue initiative in the summer of 2017! This tactical wildlife rescue and ambulatory service helps save the lives of hundreds of injured and abandoned wild animals in Edmonton and northern Alberta. Few wildlife rehabilitation centres across the country employ a dedicated team of professionals to facilitate field rescues and most lack the expertise, manpower and equipment to deal with difficult rescue scenarios. 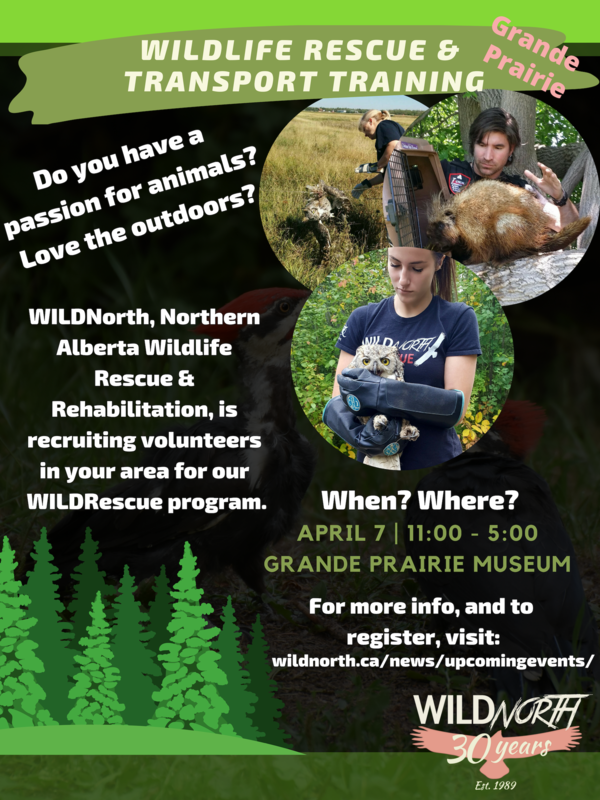 WILDNorth’s world-class, formalized rescue program is recruiting new wildlife rescue and transportation volunteers in Grande Prairie! These volunteers will be dispatched to assist with getting injured wildlife to our partner clinics and to our facilities in Edmonton and Parkland County. This training session will be occurring on Sunday, April 7th 2019 from 11:00am – 5:00pm, at the Grande Prairie Museum in the community room. It is not required, but you may want to bring a notebook and writing utensil for notes. In the first portion of this session, we will be introducing you to WILDNorth, as an organization, and the type of work that we do. The second half will cover the rescue component of your training. Registration for this training session costs $10 – you will be receiving a WILDRescue t-shirt upon successful completion of your training. You can expect a confirmation, as well as a follow-up, email upon registration.